One of my best friends from college is having a baby at the end of February and when she asked me to help plan her baby shower, of course I couldn’t have been more excited to say yes! Jess and Steve are two beautiful, caring, and laid-back parents-to-be and so I wanted the baby shower decorations to bring in the same vibe. 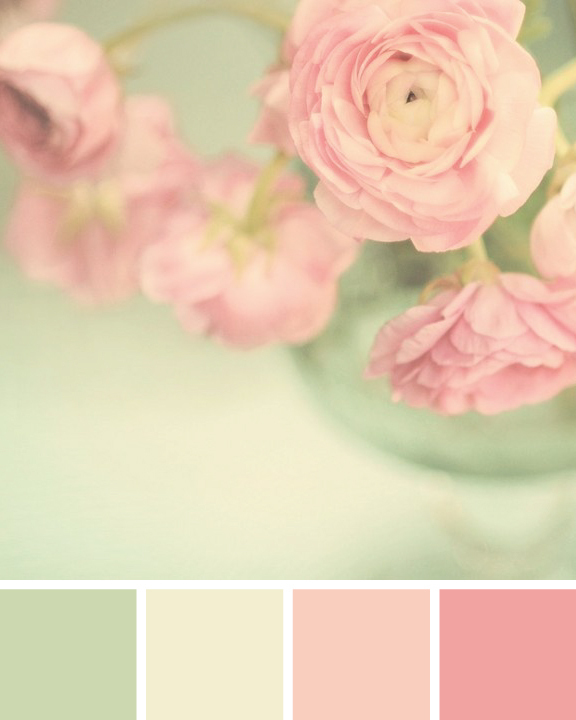 We decided on the colors blush pink, mint green, cream, and gold for the shower to celebrate their baby girl Kaléna Grace. My boyfriend, Ryan, built this rustic palette frame by adding a couple hinges and wooden legs to the back. The whole project cost under $10 and it became the perfect backdrop for some maternity photos we had taken a few weeks back. What better way to welcome guests than with personal photos of the parents to be! I added a few doilies, a handwritten chalk sign, and a stunning letter garland from Paper Source for some feminine touches. We picked up the old wooden frames from a local thrift store. The best part of all is that this palette doubled as our baby shower gift to them! In fact, all of the shower decorations can be used to decorate Kaléna’s room and serve as a reminder of how much we love her. They both come from large families so we knew there were going to be a lot of guests at the family BBQ style shower. 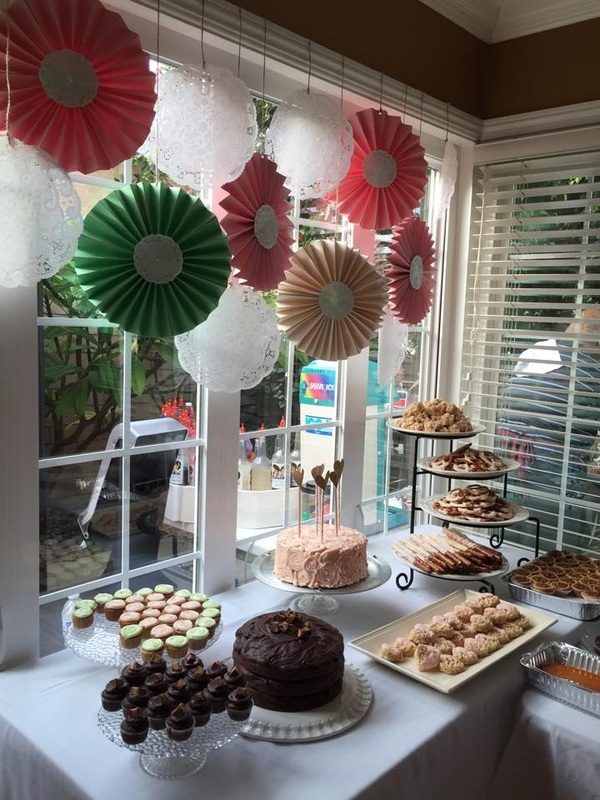 Luckily, Jess’s mother and aunts are party planning professionals! There were plenty of tables and chairs scattered throughout the house and they even had a big screen TV outside to broadcast the NFL playoff games. 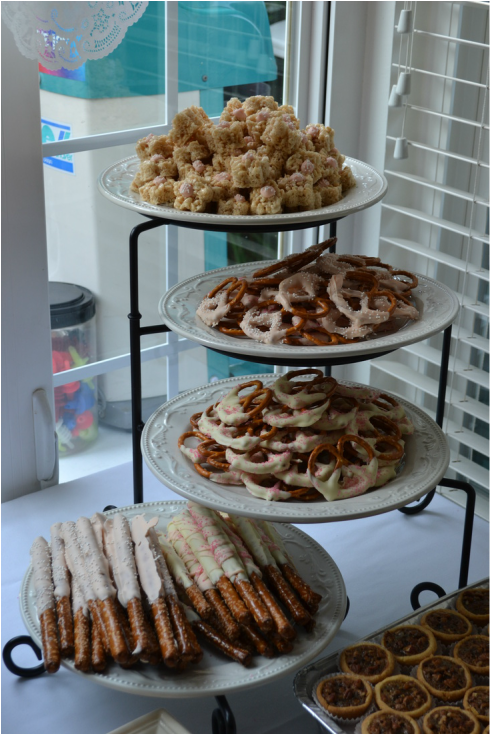 Everyone from the family brought some delicious Hawaiian style food and I took care of most of the desserts. 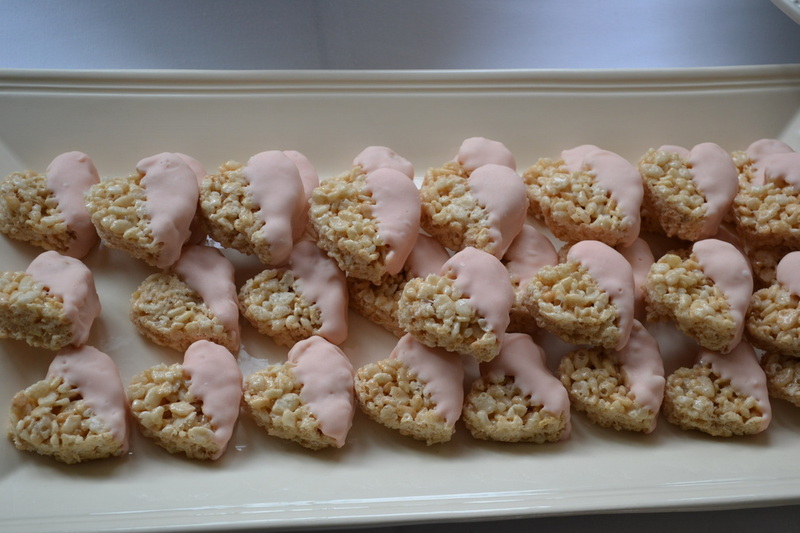 Because I was making desserts for about 100 guests, I chose crowd-pleasing sweets that are easy to make in bulk. 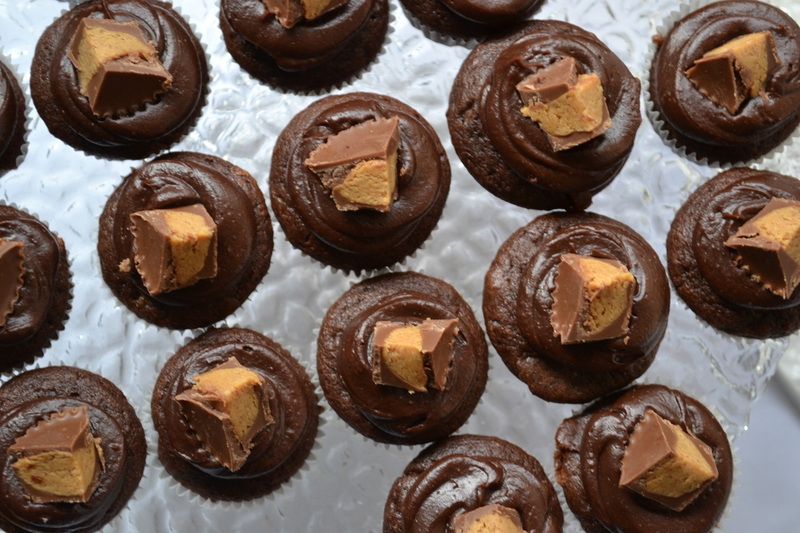 Plus, making mini treats allows your guests to feel like they can have as many as they want without feeling guilty! The stars of the dessert table had to be the two layer cakes. 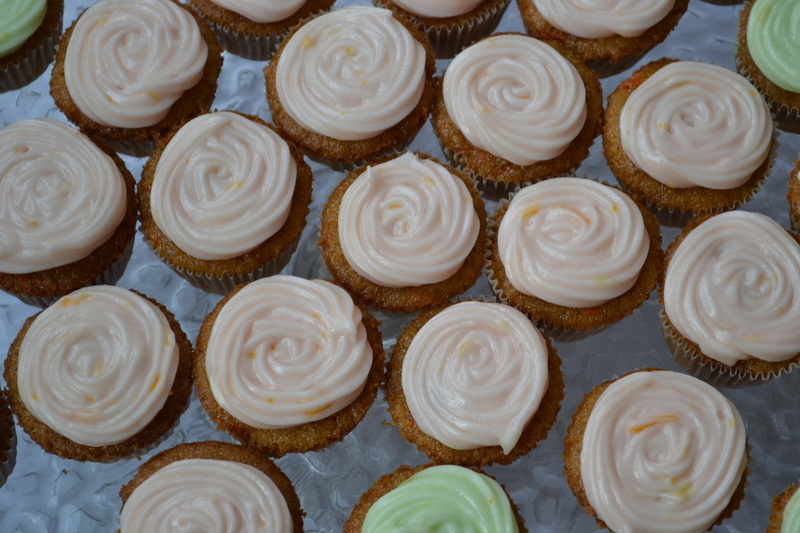 For the first one, I added a few drops of gel food coloring to my homemade cream cheese frosting to make the perfect pink. 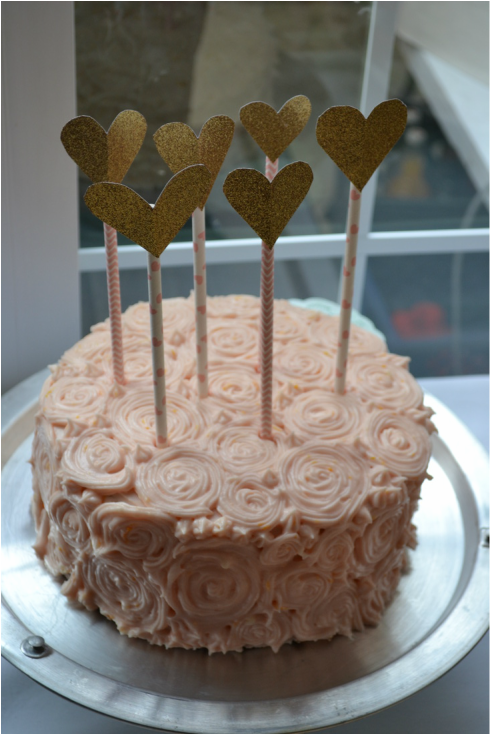 I piped the frosting into sweet rosettes and added a fun cake topper by cutting out hearts from glitter paper and gluing them onto paper straws. Easy, but adds so much drama to the top of the cake! 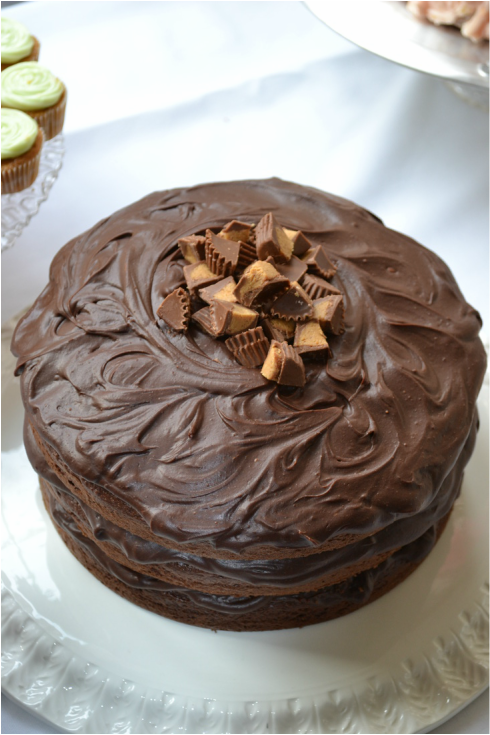 This Reese’s Peanut Butter Chocolate cake was a special request from Jess. I made this cake her birthday one year in college and we haven’t forgotten about it since. I left the sides of the cake exposed for a more rustic approach. I thought it was a nice contrast for all of the girly desserts on the table. 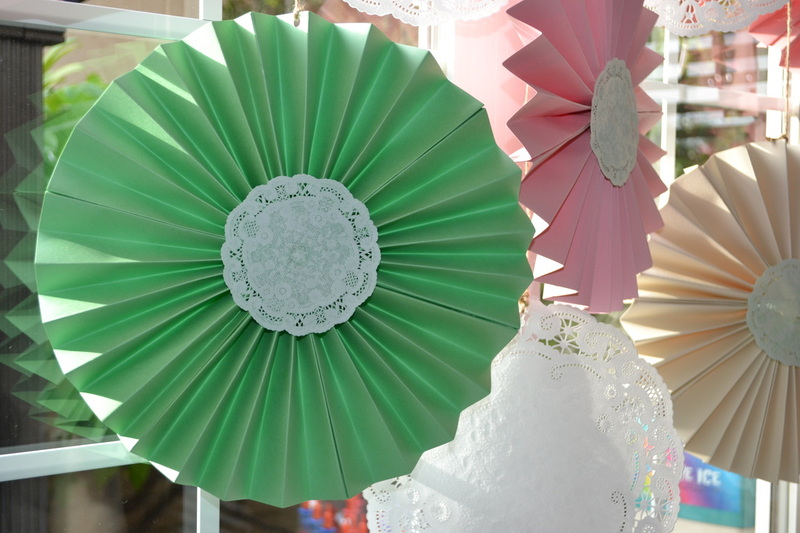 For the backdrop of the dessert table, I made these accordion paper pinwheels out of various colors of scrapbook paper from Jo-Ann Fabrics and then glued a doily in the center to hide the seams. All if you have to do is get a hole puncher, punch a hole in the top, and then hang it at the desired height with some string. I used some twine to keep on theme of rustic and feminine touches and hung some white doilies to fill in the gaps between the pinwheels. 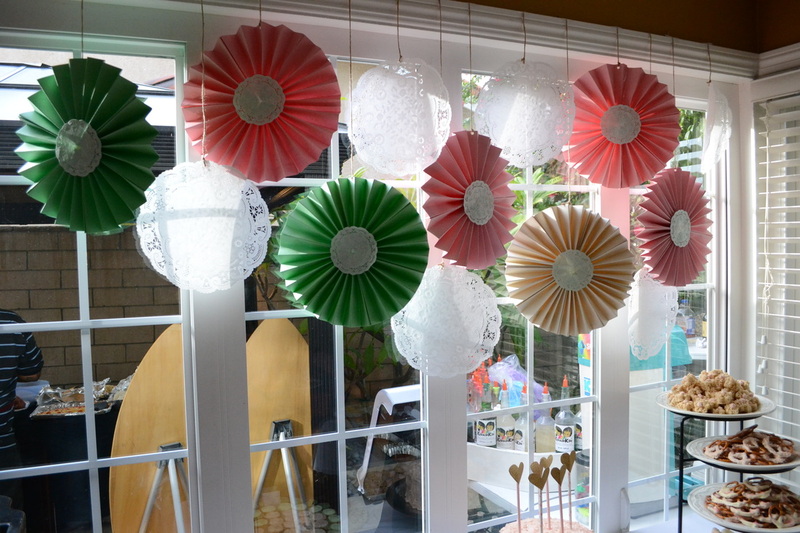 Again, the whole backdrop cost under $10 to make but added color and whimsy the table. There were lots of fun activities at the party to keep guests entertained. There was a DIY onesie and painting station, a memory game that included different kinds of baby necessities, and a competition of who can drink a baby bottle the fastest. 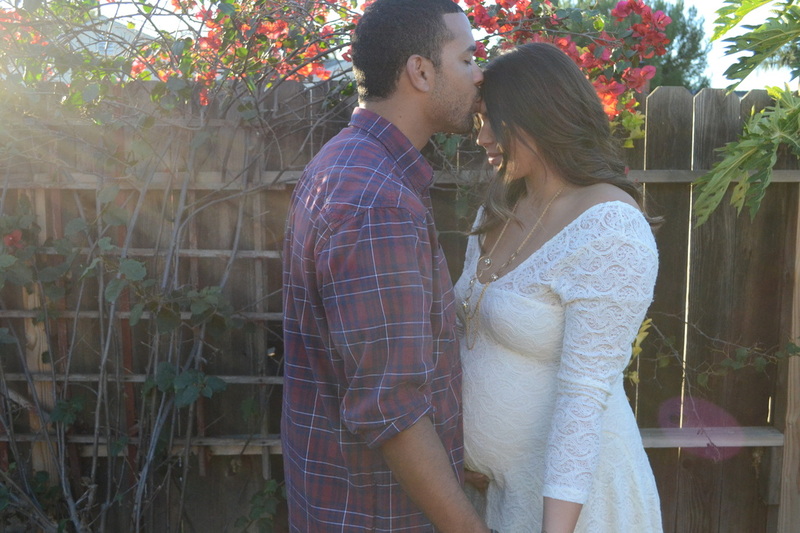 It was such a wonderful day filled with family, friends, and most importantly love. 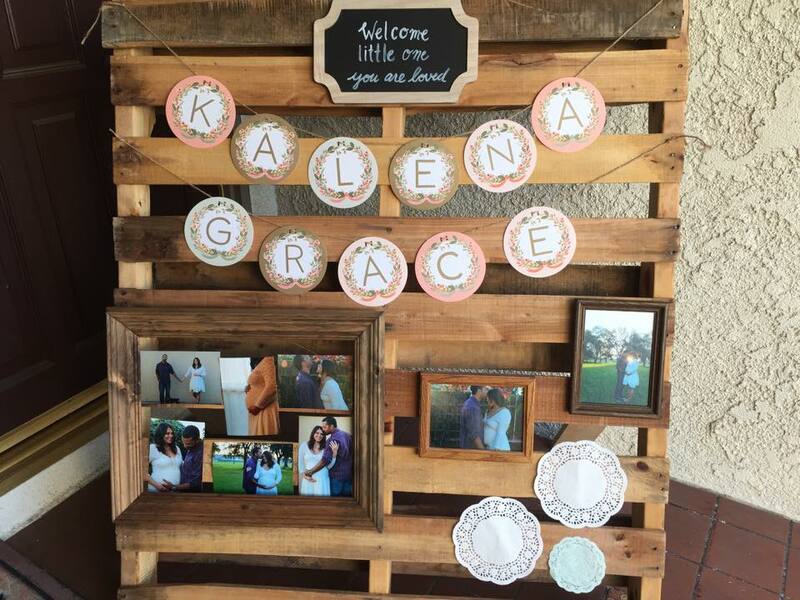 Kaléna Grace is one blessed little girl and we certainly can’t wait to meet her. I use this space to share what has been inspiring me lately.